Griswold's first vlog reviews how to determine available system NPSHA for a pump that is installed and operational. 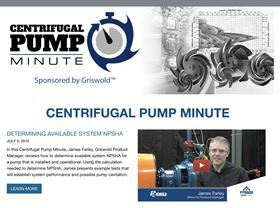 Centrifugal pump manufacturer, Griswold, has created an educational video blog called the Centrifugal Pump Minute. The Centrifugal Pump Minute is an educational blog platform for all things related to centrifugal pumps, sponsored by Griswold, a PSG Dover company, and specialists in this technology. In the vlog, Griswold product manager, James Farley, reviews how to determine available system NPSHA for a pump that is installed and operational. Available system NPSHA is the absolute pressure at the suction port of the pump and is a function of a system that must be calculated. Using the calculation needed to determine NPSHA, James presents example tests that will establish system performance and possible pump cavitation. Cavitation, if left untreated, can cause excessive vibration and serious damage to a pump. This video shows the step by step processes to test NPSHA, including where to check on the pump for each data point in the NPSHA calculation. The company will be adding to the educational content and discussing a range of centrifugal pump related topics in the future. The first video can be viewed here. James Farley in the Griswold test lab. Latest two-part vlog from Griswold. Operating at best efficiency point.